Throughout the year AYC has various social events outside of our Racing, Cruising and Education programs (which are social events in and of themselves). The main one is our monthly meeting, held the second Tuesday of every month at Aces bar and restaurant at Rolling Hills Golf Course in Tempe. The meeting officially starts at 7pm but many members show up early to have dinner and chat with their fellow sailors. 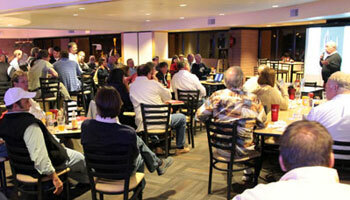 Another regular social gathering happens at Spinnaker Point, after racing on Saturday nights at Lake Pleasant. One of the fleets presents a post-race social event with club-provided beer and munchies and it kicks off a great discussion of why you blew the start on the last race. The big racing event of the year is the Leukemia Cup & Birthday Regatta, where the Saturday night dinner and party is always a great get-together. Many folks come out just to party with us on that Saturday night! We have several other events that are off the water as well. 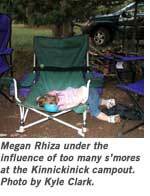 Our annual Kinnikinick Campout is held as a getaway to the cool of the Coconino National Forest. We also have an annual Commodore’s Party in May that serves to recognize members who have won the club awards and to seat the new year’s Board Members.